I've been working on a bunch of projects lately. 1. The Pinwheel top I finished this past May finally got quilted by mid-June (previously blogged about here). 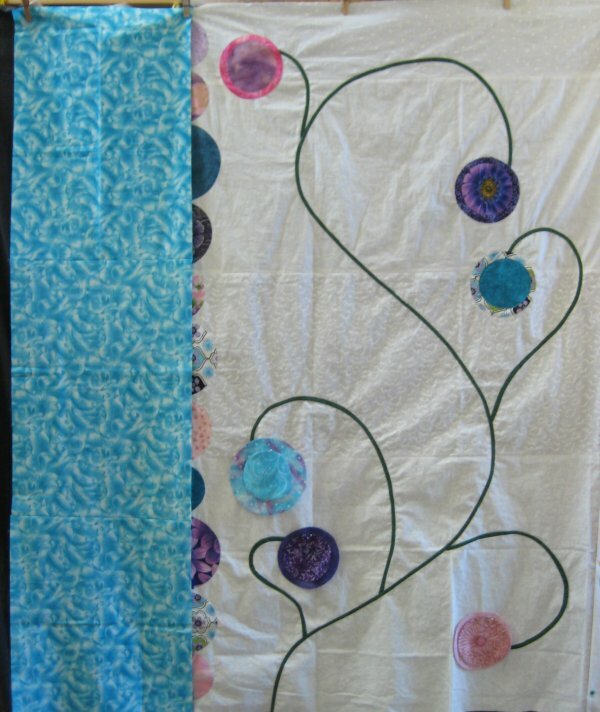 Since this was from scrap and donated fabric, I had ear-marked it for a donation quilt. As a matter of fact, I had been stockpiling a LOT of quilts that had more-or-less recently been quilted for the local charity I like to support. The Pinwheel quilt was going to join that bunch. Then the tornado hit Moore, OK. The devastation left behind was simply unimaginable. 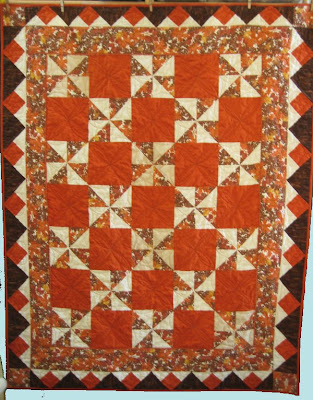 A quilt guild local to that area of Oklahoma put out a call for finished quilts .. not blocks, not UFOs, not anything that need to be assembled or finished. Well, that big, ol' box of finished quilts that was sitting in the corner of my dining room certainly fit that bill. The quilts going to my local crisis center aren't specifically "necessary". Every child who leaves the crisis nursery is allowed to take a blanket or quilt or afghan with him/her and that is where my quilts fit in. But *Moore, OK* .. well, THEY had a real need. I bundled up all 12 quilts that I had stockpiled and mailed them off to Moore, OK. I hope they are able to provide some comfort. 2. I'm continuing to work on my California Poppies needleturn applique project. I've now (finally!) completed all the background stems and leaves. 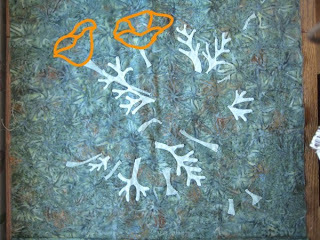 The next step is to trace all the various petal pieces onto their appropriate color fabrics and start stitching them. (I've drawn two in so you can see where they fit in). I really want to get this particular project done .. or at least the applique part .. because I already have my next Forever Project [alt-0153] lined up. 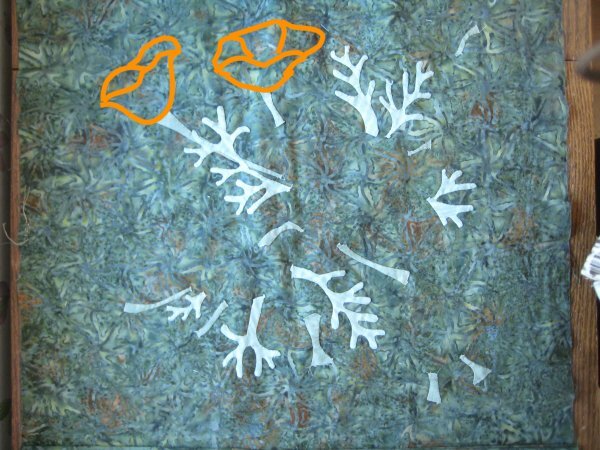 I'm eager to start it but I *know* that if I begin it now, without the California Poppies being done, I'll probably never finish the Poppies. Sooooo .. nose to the grindstone and get the needleturn Poppies stitched! for the older brother. This past May, I made a baby Rubber Ducky quilt for a new member of the extended Pirate family. The family has 2 older children. I was thinking that they might get their noses out of joint because the new baby is getting ALL the stuff and they're getting a big goose egg. So, with the permission of the Mom, the two kids told me their favorite colors and interests. 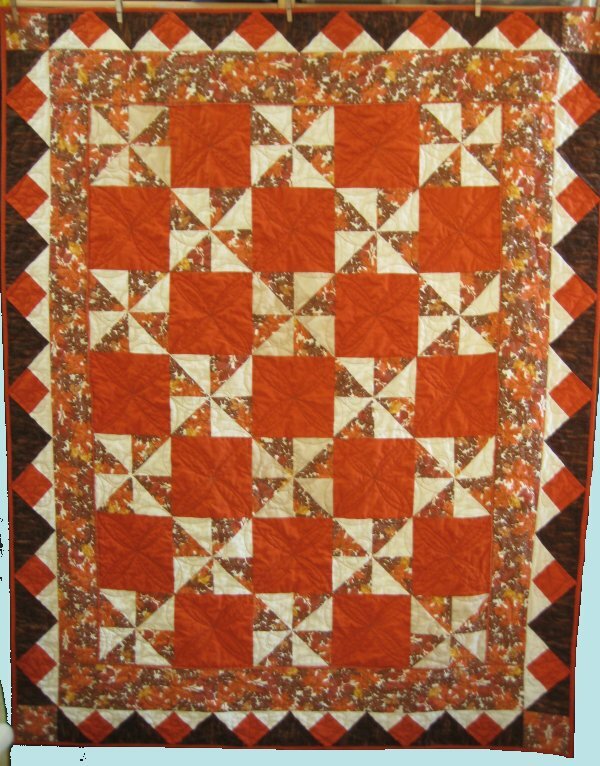 I finished the older boy's quilt just last week .. but haven't made the web page for it yet. He told me his favorite color was pink and that he liked the San Francisco 49er's and San Francisco Giants. I was deliriously happy when I found fabrics that coordinated AND fit his requirements! You'll have to be satisfied with this single picture for now. 4. Having finished the boy's quilt, I then started on the girl's quilt. I had an inspiration picture as a basis and am rapidly approaching the completion of the top. 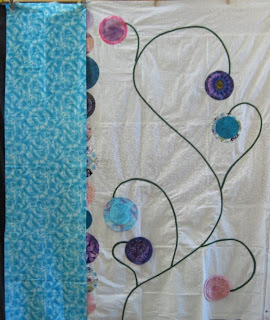 As I now see the vine up on the design wall, I think I should have curved the leftside vine with the bright turquoise flower upwards more. ::sigh:: It's not getting moved because it's already been stitched down by machine ... very small stitches. Ah, well .. such is life. I was recently shown a new-to-me technique for making pinwheel blocks, which makes (4) half-square triangle blocks simultaneously from two large rectangles, instead of the normal way I make them, which is two at a time from two squares. A small difference but it's nice to learn a new method. The webpage for this quilt contains lots more pictures, quite a BIT more verbage :-) and a link to a video (not by me) that shows the technique. That picture is just a teaser! 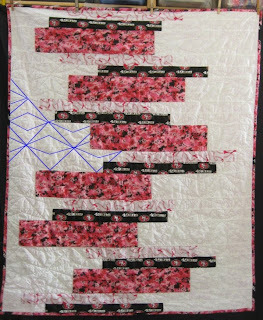 For all the gory details, links and more pictures, please visit my web page for the Pinwheel quilt. I've long been interested in my family history. When I became married to Mr. Pirate, I became interested in HIS family history also. I recently joined a local genealogical society and one lecture I attended was given by the director of the big LDS Library, which is in a nearby city. The talk was on how to effectively use the new, updated LDS website for searching. He mentioned his own researching escapades and, almost as a throw-away line, he mentioned that because one of his lines was Portuguese, he has become an expert on Portuguese research, especially in the Azores. Oh my .. did my ears perk up at that! When the meeting was over, I introduced myself to him and asked if I could make an appointment to meet with him to learn how he did his Portuguese research. He was exceedingly gracious and an appointment was set up. When we were poking around on the other line for Mr. Pirate, I mentioned that we shouldn't be looking for the Rodgers surname because in 1915, my guy changed his name. I brought a copy of the affidavit attesting to that and showed it to the director. The affidavit said, ".... on November 17, 1915, Manuel Pereirada Rozas also written and known as Manuel P Rodgers ... "
I kinda looked at him and said, well .. this is what I have (thinking .. what, are you dumb or something? That's his name *right there*. It says so!). But I didn't say that out loud; it would have been rude, ya know. He continued on, saying, it looked to *him* that the spacing was wrong ... that the person writing down the information wasn't hearing it correctly and so typed it incorrectly. He was sure the name was really .... Manuel Pereira da Rozas. !!!!!!! Oh. My. Gosh. That makes SO MUCH SENSE. Pretend you're Manuel. You have a Portuguese accent. You might be fluent in English because you've been in this country for decades, but you still have that accent. Now, say your name. Manuel Pereira da Rozas. Slur the Pereira and da together .. what does it sound like? Pereirada. Bingo. So, the family name, way back when, wasn't simply Rozas .. but da Rozas. Not that it makes any huge difference to my research, but we now know the family's true surname. That alone was worth the trip to the LDS libary. I tell ya, I was one happy camper!